I have been working on my urban night photography project. This is on the University of Nevada, Reno campus. I have been working on my custom made variable interval timer for long exposure photography and now have all the initially planned functions working and have added a couple features. I consider it a fully funtional proof of concept/prototype. I have searched and have not found anything like it except for hardware that depends on your cell phone to provide the interface and computing power, mine is completely stand alone. To be able to confirm support for Canon cameras, I need access to one that has the 3/16″ remote connection to test with and determine how long the long exposure noise reduction exposures are, the save to card speed of the camera with a slow memory card, etc. If someone is interested and has the technical skills to make one themselves, they should contact me. We went to Las Vegas, Nevada for Christmas. This was taken on the drive there from Reno. This panorama is build from sixteen HDR photos. I will post more from the trip as I complete the editing process. 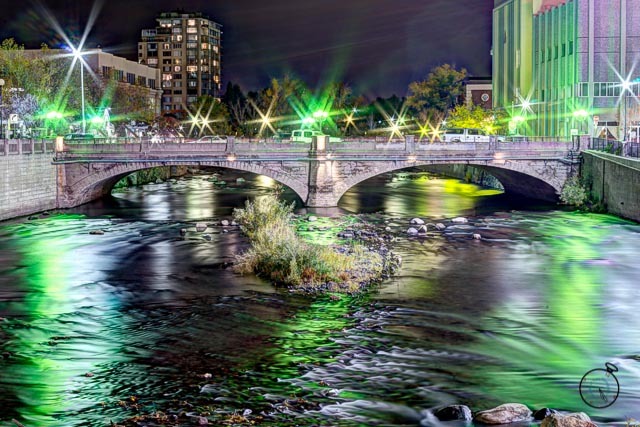 I have been working on more HDR night photographs and as part of streamlining my workflow I build a custom timer. It is based on an atmel microcontroller with a touch screen. I currently programmed it to work with a Pentax camera with the long exposure noise reduction turned on. It will automatically take the number of exposures that it is currently set for automatically delaying for the noise reduction. Since most Canon cameras use the same connector and pinout for the wired remote it would work with a Canon camera, with minor tweaks to deal with any differences in the noise reduction. I defined the shutter durations as follows: 1 sec, 2 sec, 4 sec, 8 sec, 15 sec, 30 sec, 1 minute, 2 minutes, 4 minutes, 8 minutes, 15 minutes, 30 minutes, 1 hour, 2 hours. I have yet to do anything that I needed more than a 15 minute exposure, but I have plans to try some longer exposures in the future. I used this for my Reno Motels project that I started working on this fall and it worked very well after a few tweaks the first night out. I will share the schematic and code directly with people that are interested in using it only if they are willing to provide feedback to improve it. I will consider building them for people that do not have the interest or skills to build their own. If I build it for you there will be a cost involved and it will depend on the cost of parts, build time and something to support additional development and features.